What better way to spotlight trails than do the one thing that can preserve them: Ride them?! NORCO—It’s a Friday afternoon, and Mike Williams returns home to Fourth Street with his 16.1-hand Mustang gelding, Cowboy, after a day of what he loves most—trail riding. This breezy January ride went 20 miles, a perfect distance to get Cowboy ready for an upcoming 300-mile journey that he and others have been planning for more than a year. The three-week trip, leaving Norco April 30 and arriving at Bishop May 21, will take Williams and co-riders Rebekah Wan and Ray Spence along urban routes out of Horsetown USA, up and beyond the Cajon Pass, across the Mojave Desert and ultimately into Owens Valley along the Eastern Sierra. 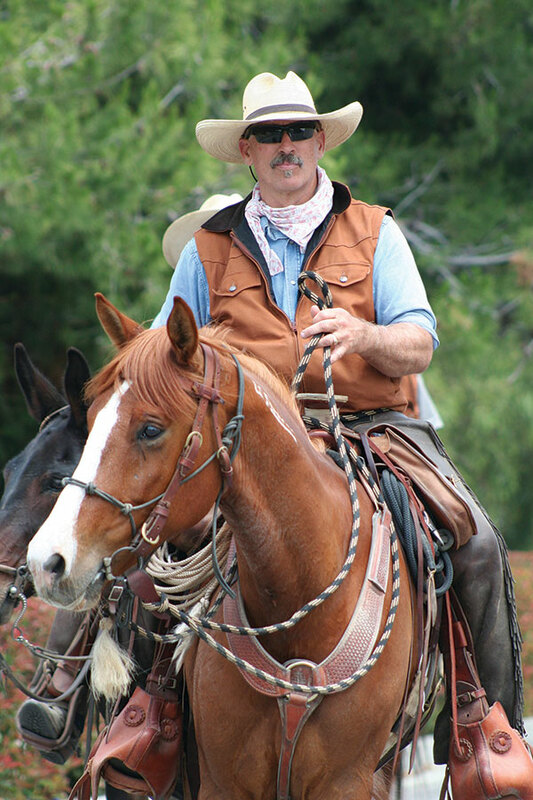 Conditioning is a key part of an extended ride, and this one is the longest ever undertaken by Williams, an avid Backcountry Horsemen member whose list of credentials include San Bernardino County search-and-rescue certification, FEMA large animal rescue and Wilderness First Responder. The first three days, from Norco to Phelan, will average more than 20 miles a day before the first layover, after which another three-day stretch to Red Mountain will be slightly longer. All told, the short days will be 15 to 16 miles; the long ones, 25 to 26. Wan, a BCH member whose younger years were spent in a dressage saddle and on jumpers as well as on the trail and in horse camps, has ample experience to join this trip. 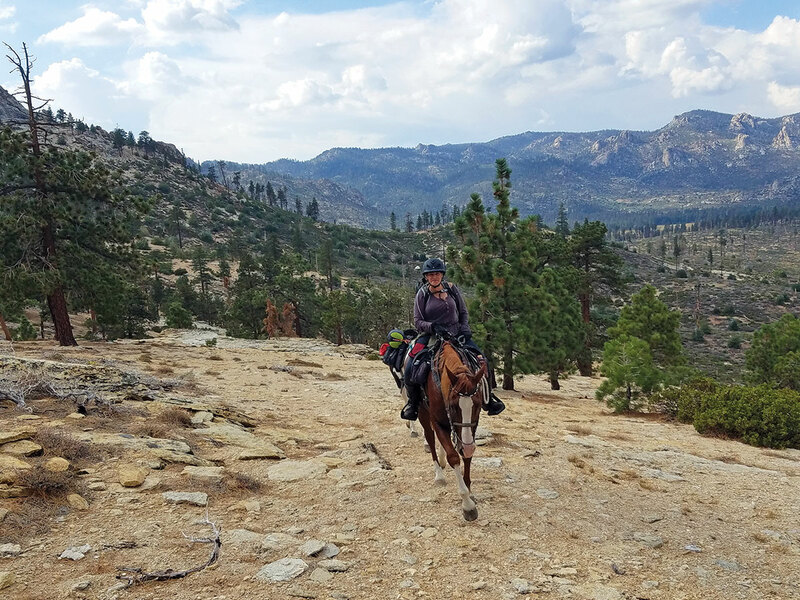 Like Williams and Spence, trail riding and wilderness are part of her, thanks to a lifelong exposure to them, and like her partners, she wants to educate and inspire others to hit the trail. The riders also share a heartfelt bond to save trails for horses. The adage “use them or lose them” holds true—whether the pressure comes from developers in urban areas or cuts into public land access. Founded in 1973, Back Country Horsemen of America now has 194 state and local chapters nationwide with a clear mission: keep trails open on public lands. Keeping trails involves maintaining them, and in 2017, BCHA volunteers spent 324,154 hours working on trails in public lands. Education also drives Wan, who sees teaching as a tool to get horsepeople out on the trails more. Whether for a one-day wilderness ride or for a 300-mile journey to Bishop Mule Days from Norco, planning is key. The support team behind this trip is well-prepared, featuring the spouses and Elaine Bailey, who’ll spearhead the ground crew. Williams and Wan will garner lessons from this expedition, too. Both are putting in for the Wilderness Riders program that trains stock users about the value of wild lands and the importance of Gentle Use / Leave No Trace Skills. “It’s going to educate us and it’s going to allow us to share with other people what it means to be a wilderness rider or a ‘leave-no-trace’ expert in the backcountry. “It also will show our friends and other people that we’re capable of doing this—and that anyone can do this, too,” he smiled.